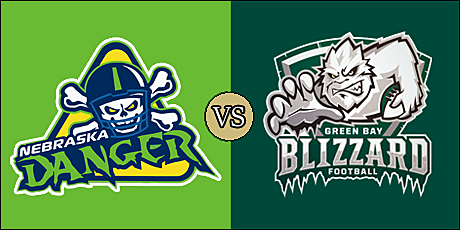 GREEN BAY, WI - Lenorris Footman rushed for five touchdowns, including what turned out to be the game winner with 25 seconds remaining, as the Green Bay Blizzard picked up their first win of 2019, 53-52, over the Nebraska Danger tonight at the Resch Center. The Blizzard improve to 1-1 on the season with the win, while the Danger fall to 1-1 with the loss. The Danger win extends their winning streak over the Danger, as they won the last two meetings of 2018 by scores of 47-25 and 31-20. All eight touchdowns in the first half -- four by each team -- were scored on rushes. Footman put the Blizzard on the board early, scoring on a three-yard run just three minutes into the contest. The Danger came right back on Davonte Sapp-Lynch's five-yard run to knot the score at 6:46 point of the opening quarter. Footman scored again from three yards out to give Green Bay a 14-7 lead by the end of the first quarter. Troy Evans scored on a four-yard run, but Jerod Haynes; point after attempt sailed wide left. The Blizzard went up 17-13 on a 34 yard field goal from Cody Barber with 7:50 left in the first half. The Blizzard then blocked a field goal try and proceeded to take a 24-13 lead on Footman's four-yard run. Sapp-Lynch pulled the Danger to within five points on a two-yard run at the one-minute warning. After a fumble recovery by Nebraska on the ensuing kickoff, Sapp-Lynch scampered in from three yards to give the Danger their first lead of the game at 25-24. Green Bay drove to the two-yard line before B.J. Hill found his way into the end zone with 18 seconds left in the half. That was just enough time for the Danger to add a 30-yard field goal from Haynes. The Blizzard led 31-28 at the break. Haynes missed three of his four extra point attempts in the first half, with all three going wide left. The teams traded interceptions to open the second half before Nebraska quarterback Tommy Armstrong gave the Danger their second lead of the game at 35-31 at the 9:45 mark of the third quarter. Green Bay was not able to respond with a touchdown and settled for a 20-yard field goal from Barber with 4:35 left in the third quarter. The Danger came back on the next play from scrimmage with Armstrong hitting a wide open Troy Evans. The touchdown bomb put the Danger up 42-34 with just under four minutes left in the third; a score which held through the end of the quarter. The Blizzard drove down and scored on a nine-yard run from Kamal Cass. Green Bay was unable to convert the two-point conversion as the defensive line forced an errant pass by Footman. The Blizzard defense was able to force the Danger to settle for a 27 yard field goal by Haynes to extend their lead to 45-40 with 8:21 remaining in the fourth. Footman put the Danger up 47-45 with 4:29 remaining on a 10-yard run. Nebraska re-took the lead on Armstrong's 29-yard bomb to Gregory Dent, Jr. with 1:08 left. On the ensuing kickoff, Hill returned the ensuing kickoff to the Danger 10 yard line as the game hit the one-minute warning. Footman once again put the Blizzard back up; this time on a six-yard rush with 25 seconds remaining, however, he was short on his two-point conversion run around the left side and the Blizzard lead was 53-52. Armstrong attempted to move the ball downfield, but was intercepted by the Blizzard, who were able to run out the clock to preserve the win. Statistically, it was a very even game, with the Danger holding a 243 yards to 241 advantage in total office. Nebraska had edge in passing, and Green Bay held the edge in passing. The Danger were penalized eight times for 65 yards, while the Blizzard were flagged five times for 29 yards. Each team forced two turnovers. Footman completed 11 of 19 passes for 104 yards and an interception, and rushed 16 times for 77 yards with his five trips to the end zone. Kamal Cass had 48 yards of eight carries with a touchdown. Hill scored a rushing touchdown to go along with a pair of receptions for 21 yards. Levi Copelin led the Blizzard in receiving with 4 catches for 39 yards. Jarar Johnson and Bakari Triggs each picked off passes for the defense, and Truett Box and Teko Powell combined for a sack. Cody Barber hit both of his field goal attempts and all five of his extra point tries. Aside from a pair of interceptions, Armstrong had a solid outing for the Danger, going 14 of 23 for 134 yards and two touchdowns. He also rushed for 73 yards off seven carries with a score. Sapp-Lynch added nine carries for 33 yards to go along with his three rushing touchdowns, and caught four passes for 19 yards. Evans led all receivers with five grabs for 64 yards and a touchdown, while Dent added three receptions for 45 yards and a touchdown. Najee Bright led the way for the Nebraska defense with 7.5 total tackles, a forced fumble and fumble recovery. Jason Butler recorded an interception for the Danger. The Danger are back in action on May 9 when they host the Sioux Falls Storm at 5:05 p.m. pacific (7:05 p.m. central). The Blizzard had to Des Moines to battle the defending champion Iowa Barnstormers on May 9 with kickoff set for 5:05 p.m. (pacific) (7:05 p.m. central). Best game of the season so far. Green Bay showed a lot against a pretty good Nebraska team. They had a lot of poise at the end.